River fishing can sometimes be quite an intimidating prospect, even to those who consider themselves reasonably experienced anglers. Locating the fish is the first hurdle, finding an effective technique to catch them is the next. Often, a few hours with a guide, instructor or ghillie can make all the difference and their skills and knowledge will be with you whenever and wherever you fish thereafter. The Foundation has several recommended fishing instructor/guides for both the Wye and Usk that are available for you to hire on an hourly, daily or even weekly basis. They can meet you by the water or pick you up from your accommodation and provide you with the right tackle to fish our rivers and streams. Please either click on the links opposite or contact us on 01874 712 074 for more details or for impartial advice on which guide would suit you. 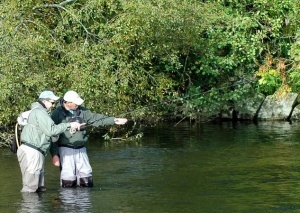 Having the appropriate tackle is essential to fish our rivers effectively. For a start, the mudstone bedrock over which most of the upper Wye and middle Usk flows renders waders with ordinary rubber soles quite useless. Studded or felt soles are absolutely essential. You will also need the right fishing tackle for the river or reservoir you are visiting. If you are hiring a guide or instructor, all this can be provided as part of the service. In addition, the area has some excellent fishing tackle outlets, links to which can be found opposite.